Mick Corse and his Turbine bike. This machine is still on the bench as far as I can tell. I'm going to put it up top here because we see so little turbine bikes. Enjoy. It's a good idea to have the exhaust pointing sideways here. Remember how Jay Leno told that story of some guy coming up too close to him whilst he was out on his Y2K Turbine bike? The guys car bumper melted away! 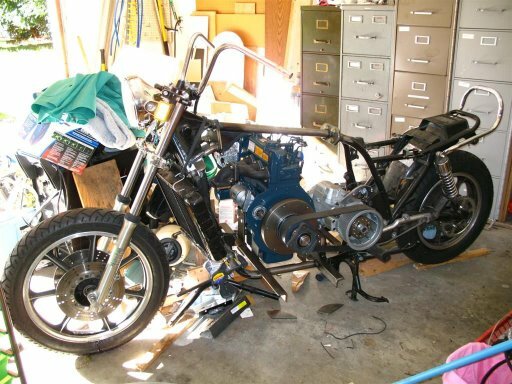 It seems some students have put in work to covert A BMW Boxer engine to run on Diesel. All links I have are now dead. I do not know the outcome here. 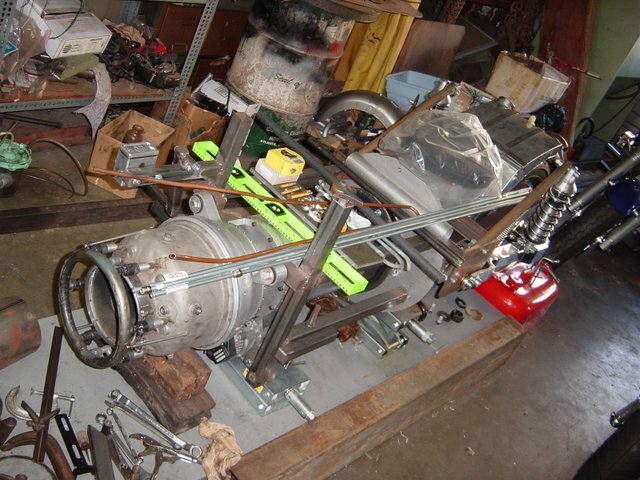 "It seems some students have put in work to covert A BMW Boxer engine to run on Diesel. All links I have are now dead. I do not know the outcome here." Maybe you're talking about the school I studied mechanical engineering from 2000 till 2004, Fachhochschule Bingen? As far as I know the BMW engine has not been converted to Diesel, and I think this has not been intended. 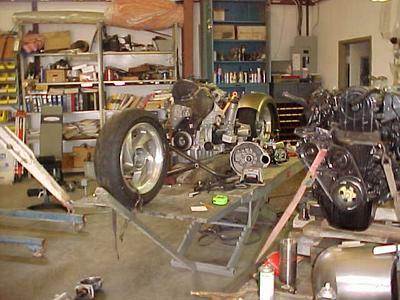 This engine was converted to an "Inline Boxer", that means, the offset between the 2 cylinders has been brought to zero using a custom made crankshaft with a big connecting rod in the center for cylinder 1 and two small rods (left and right of the big one) for cylinder 2. This engine was running very smoothly, which was demonstrated with that popular test where a coin is standing on top of an engine. All that was part of a bigger project: a 3-wheeled, 3-seated city vehicle with outstanding safety and economic capabilities. 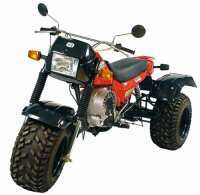 It was planned to have a 2 cylinder 2 stroke diesel boxer engine. So the BMW Inline Boxer was only one of several pre-stages to prove the feasability. We had Hatz Diesel engines as well, one was converted from 4 stroke to 2 stroke, another one was converted to a hydraulic valve control, but this one had big problems with oscillations. 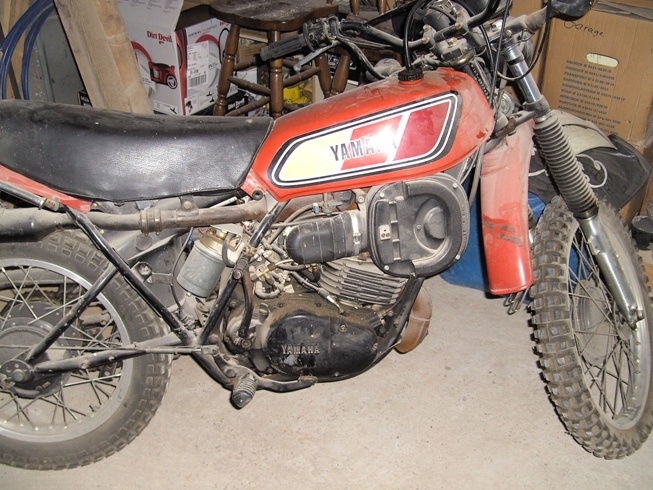 I could save one of the first experimental vehicles from scrapping: a Yamaha DT250MX which has been converted to Diesel. 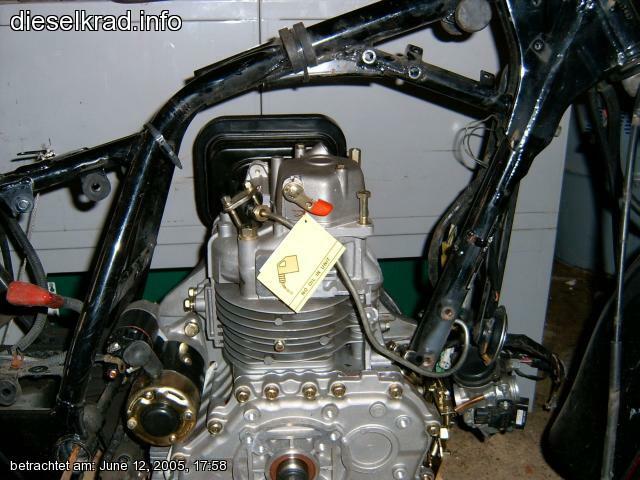 The original engine (2-stroke) was converted using a custom made cylinder head and an Opel Kadett injection pump. If you're interested, I can send you some pictures. 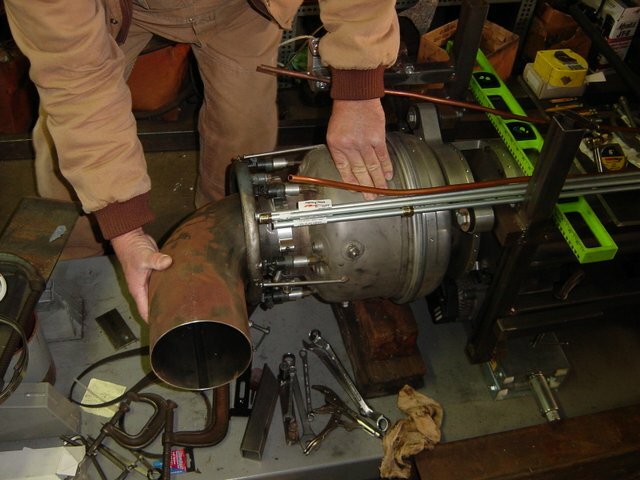 The project itself died due to several reasons: One of the professors retired, they recognized that many of their ideas were already out-dated by the common progress and the problem with the hydraulic valve control seemed to be insolvable. But I guess the Inline Boxer is still alive for demonstrations. There's a guy from a German bike magazin who waits to make an article about it as soon as it's in a clean and running condition... so there might be better pics available in the future, I hope. It's not easy to start. 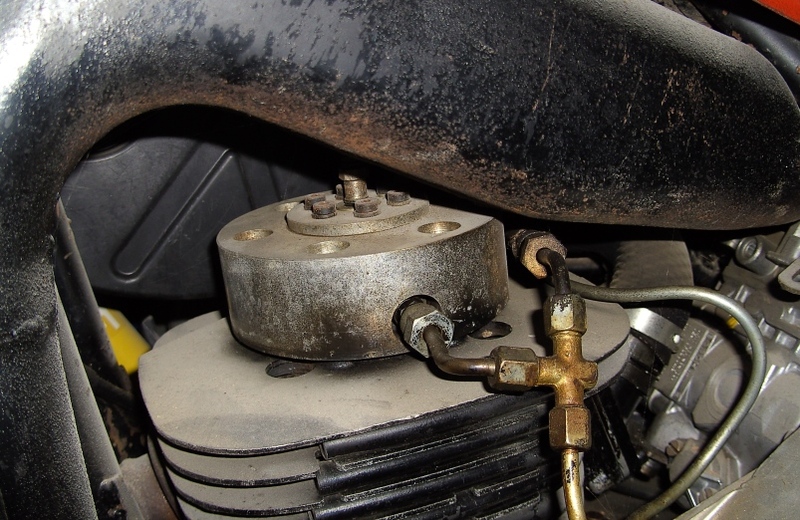 The bike is equipped with 6V only, so you need an additional 12V car battery to supply the glow plug. But even then it's hard to start with the kick starter. I used an electric heat gun to pre-heat the intake area which helped a bit. You can't push it, even in 5th gear and pushed by 3 guys the rear wheel will skid due to the high compression. When it's running, there's pretty much smoke and a special sound. It's not so much like a Diesel, not that hard hammering, it still remembers the typical 2 stroke sound, but different from the gasoline 2 stroke sound. There's pretty much power (for a 250cc Diesel) between 2000 and 4000rpm, but above that there's not so much. I've been told you can go around 80km per hour, so it should produce something around 8kW. Up to now I have only tested off road. Very pleased to get this info from Sascha. I did wonder whether it belongs in the school section but I'll post it here for the moment and perhaps duplicate it there in time. 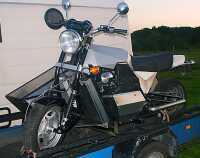 Originating in Berlin, Andreas Kossmans Diesel Motorcycle first made it's public appearance at the 2002 Hamm Diesel Bike rally where it arrived on a trailor. I gather work is still going on with this machine, which sports a 1.4 litre Ally Citroen engine. The futuristic looking machine from Andreas. A 3 cylinder Daihatsu takes shape.. 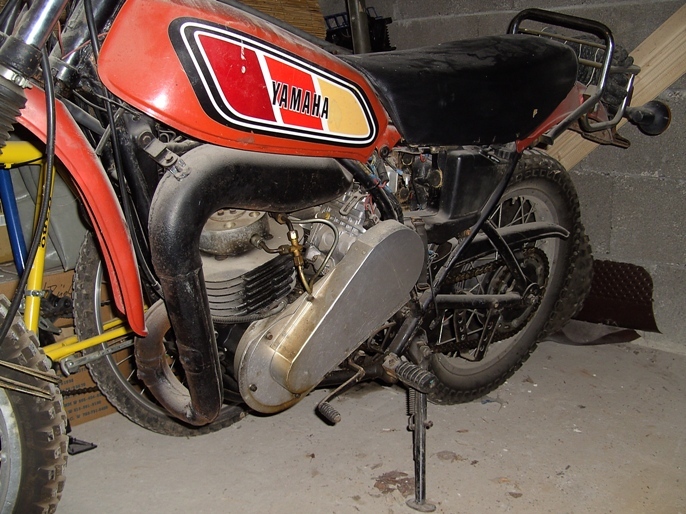 The Fermer ZDT is a Russian 2 stoke bike which originally came with a 197cc engine. Martijn Stehouwer is in the process of modifying one of these machines by fitting a Hatz 1B30 engine. If I find out this is more of a commercial venture I shall move the bike into the appropriate category. Martin can be found at EMOT Racing. A Diesel ATV in the making. 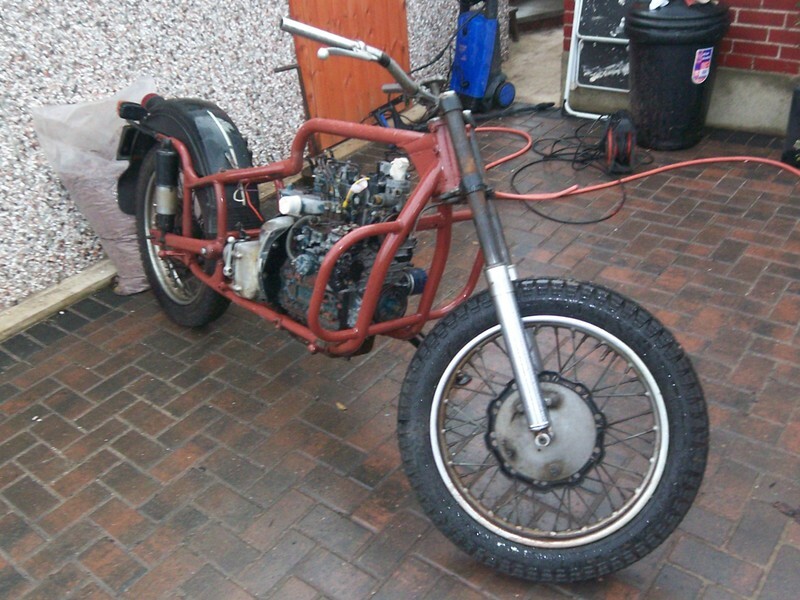 Sumo's bike consists of a Kubota 950 3 cylinder engine, a BMW clutch and a Dnepr frame. Questions to him on the forum. This project is now up for sale on the forum. As far as I know this bike is still under construction. Please let me know if it get's finished sometime soon. Still in it's early stages this Suzuki Marauder is to be fitted with a 10 HP 406cc Yanmar L100AE engine. It is planned that the original Gearbox will be used. 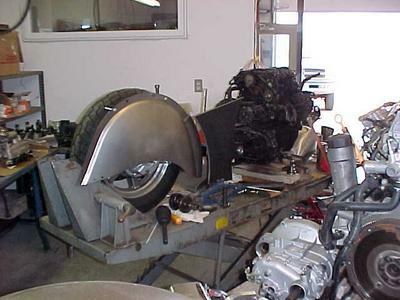 A US VW Scooter in the making.